AUDIO SHOWS. My FAVOURITES & my recomendations. >>Any Jethro tull fan or collector should have these essential ones. GO TO DVD FAVOURITES LIST . >>It's exists a double cd set but This one sounds better. Terrific show ! 26-09-84 Sporthalle, Cologne, Germany. 2cd. LIVE IN SAN SEBASTIAN, SPAIN. THE EMPIRE SHEPHERDS BUSH, with Lucia Micarelli. DVD SHOWS.My FAVOURITES & my recomendations. 9. Living In The Past. Dogs In Midwinter inst Finale. Cheerio. >>Nice present from Brazil. Excellent image and sound. The first broadcast show for some years They exists many copies and many art but finally I found this copy, entire show in one dvd. Indexed song by song. Before that, they circulated double vcd, bad dvd copies...It's highly recomended and nice work of that Brazilian TV. >>Sadly, they don't exist many TV broadcast Jethro Tull shows . I've found them on very few occassions. Fortunately there have been some shows on TV these last years. This one, performed under heavy rain, is excellent and setlist, too. 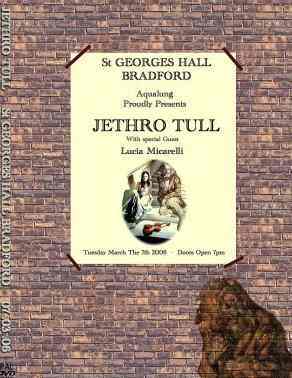 The show was broadcast entirely and it's the Jethro Tull show we all wanted to keep in our shelf, without intermission, edit cuts and retouch images.They circulated many art and some copies. I've two copies, tow different qualities.Highly recomended as Sao Paolo one. 30-06-01 , 1 DVD EX. 10. Locomotive Breath (Feat C.Bunker / D. Palmer). Clive Bunker & Doane Perry drum battle. 1. Life Is A Long Song.